At Beddard Roofing Ltd though, we can help you thanks to our experienced roofer Stockport services. If you believe that your chimney is causing your roof to leak, we can check everything over for you and let you known whether the issue can be repaired, or if your chimney stack needs to be removed. 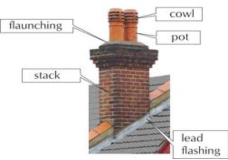 The flashing around your chimney stack may weaken, allowing damp to develop within your home. In especially bad cases, serious leaks can appear within your home and they may not be located directly below your chimney stack because of how the water travels through your roof. This can cause a lot of damage. If you look up at your chimney stack from the ground, you probably won’t be able to tell whether there is anything wrong with it. This is precisely why you will need to call in a specialist such as Beddard Roofing Ltd.
As one of the leading roofers in Stockport, we will be able to talk you through the various options that are available, from chimney stack removal to chimney stack repairs.